DALLAS, TX--(Marketwired - November 19, 2014) - The South Florida apartment market remained the second strongest in the nation in October 2014, with the West Palm Beach-Boca Raton-Boynton Beach Metropolitan Division pacing the growth, according to Axiometrics, the leader in apartment market research and analysis. With three of the top 13 markets nationwide, South Florida trailed only the San Francisco Bay Area, which sported three of the top four markets. 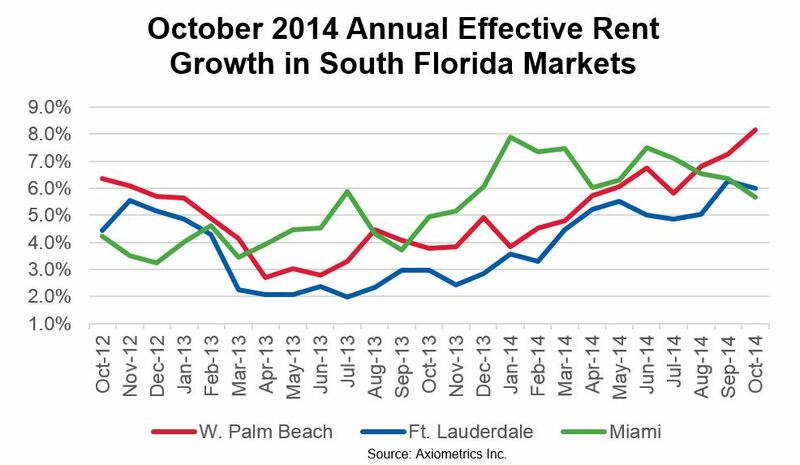 Average effective rent growth in the West Palm Beach metro was 8.2% in October, No. 6 among Axiometrics' top 50 markets nationwide and a 90-basis-point (bps) increase over September's 7.3%. The rate has increased 10 of the past 12 months and was 440 bps higher than the 3.8% of October 2013. The average rent in West Palm Beach is $1,374 per unit per month, compared to $1,260 one year ago. The Fort Lauderdale-Pompano Beach-Deerfield Beach division was No. 10 among the top 50, though effective rent growth fell from 6.3% to 6.0% in October. Fort Lauderdale's rate is 305 bps above the October 2013 figure of 3.0%. Renters are paying an average of $1,385 per month, up from $1,304 in October 2013. No. 13 Miami experienced a decrease in effective rent growth to 5.7% in October from 6.4% in September and is in the midst of a four-month period of decline. Though Miami's rate was 181 bps lower than the recent peak of 7.5% in June, it was still 74 bps higher than October 2013's rate of 4.9%. The average monthly rent in Miami was $1,490, compared to $1,418 one year ago. Miami occupancy was 96.0% in October, West Palm Beach's was 95.8% and Fort Lauderdale's was 95.4%. "Miami could be starting to feel the effects of the apartment construction boom," said Stephanie McCleskey, Axiometrics Vice President of Research. "Almost 5,300 units have been delivered over the past two years, and landlords could be fighting for residents with lower rents. West Palm Beach is a less expensive alternative." Axiometrics improves property and portfolio performance for apartment investments. Confident investment decisions begin with reliable, timely information. No one has more accurate, detailed, and up-to-date research on the apartment and student housing markets. Learn more at www.axiometrics.com or by calling 214-953-2242. About this company Axiometrics Inc.